You roll two dice. 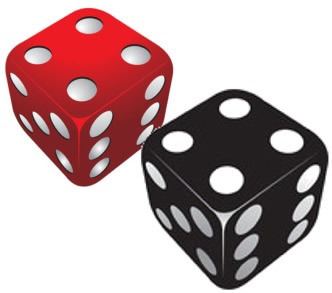 The first die shows a ONE and the other die rolls under the table and you cannot see it. Now, what is the probability that both die show ONE? Explanation You know one of die shows a ONE, the probability of ONE on other die is 1/6. You decide to tell your fortune by drawing two cards from a standard deck of 52 cards. What is the probability of drawing two cards of the same suit in a row? The first card is not replaced between drawing the cards. Explanation An example: You draw a heart. Now 51 cards are left. 12 hearts are left. Prob. of another heart 12/51. All suits = 13 cards. Same for all suits. A new bag of golf tees contains 10 red tees, 10 orange tees, 10 green tees and 10 blue tees. You empty the tees into your golf bag. What is the probability of grabbing out two tees of the same color in a row for you and your	partner? Explanation You grab red tee. (Could be any color.) 39 tees remain. 9 red tees remain. Prob. of another red is 9/39. In a library box, there are 8 novels, 8 biographies, and 8 war history books. If Jack selects two books at random, what is the probability of selecting two different kinds of books in a row? Explanation Example: Select a novel. 23 books remain. 16 books not novels. Prob. of NOT a novel 16 out of 23. Same for each book. What is the probability that the sum of two die will be greater than 8, given that the first die is 6? 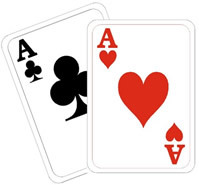 What is the probability of drawing two aces from a standard deck of cards, given that the first card is an ace? The cards are not returned to the deck. 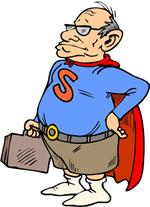 A new superman Master Card has been issued to 2000 customers. Of these customers, 1500 hold a Visa card, 500 hold an American Express card and 40 hold a Visa card and an American Express card. Find the probability that a customer chosen at random holds a Visa card, given that the customer holds an American Express card. Using these 545 students as the sample space, a student from this study is randomly selected. a) What is the probability of selecting a student whose favorite sport is skiing? b) What is the probability of selecting a 6th grade student? c) If the student selected is a 7th grade student, what is the probability that the student prefers ice-skating? d) If the student selected prefers snowboarding, what is the probability that the student is a 6th grade student? e) If the student selected is an 8th grade student, what is the probability that the student prefers skiing or ice-skating? A bag contains 12 red M&Ms, 12 blue M&Ms, and 12 green M&Ms. What is the probability of drawing two M&Ms of the same color in a row? When the first M&M is drawn, it is looked at and eaten. A survey is conducted at Lincoln High School regarding the number of text messages sent and received per week. If a student is chosen at random from this survey, what is the probability that the student texts over 50 messages per week given that the student is in the Junior class?